It has become quite apparent to me over the last week or so, just how spoilt we are. I don’t mean this in an ‘I get everything I want’ kind of way, I mean it in an ‘I have such an easy life’ kind of way. I should probably just title this post “#blessed”, but I’m not sure if that is the truth of it. 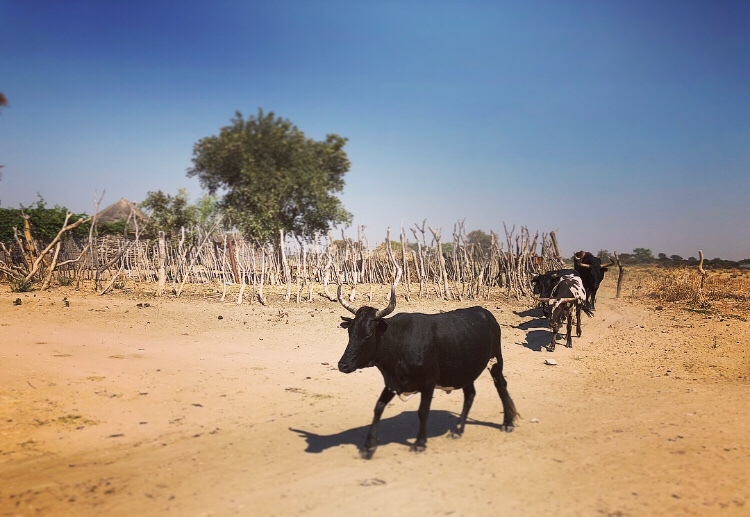 We had just driven from Etosha to the Caprivi strip, and the landscape changed dramatically. There is something called a ‘vet fence’, which is a large fence entirely separating the very north of Namibia from the South. The Northern lands were given back to the native Namibians, but as the spread of disease between animals was rife, the government-run South fenced it off and implemented policing of the borders, stopping any meat products from being taken from the North into the South. What’s interesting is that as soon as you cross over that ‘border’, there are animals everywhere! Cows, goat, sheep – all walking across the road, grazing on the verges, it’s like crossing into really-rural Africa. Suddenly there are kraals or homesteads every couple of hundred metres. The houses are all built out of wood and grass, and there are people walking along the side of the road carrying buckets of water on their heads, or on poles supported by two people. Even the children carry water. 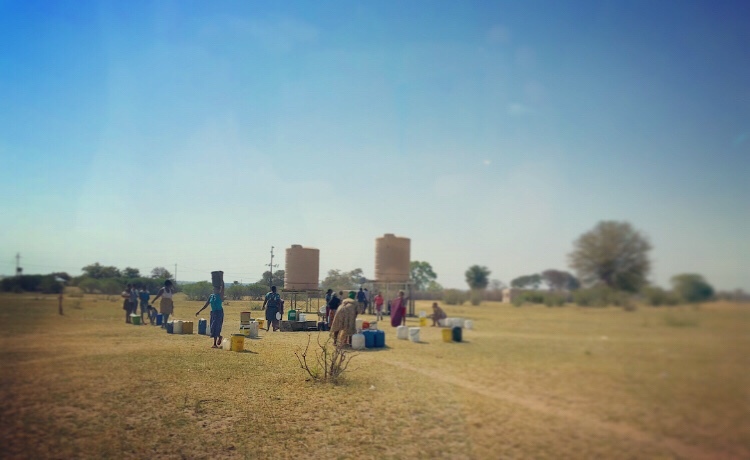 The first time I ever had to carry my own water was when Cape Town had its severe drought last year and suddenly we had to carry buckets of water from the shower to flush the loo’s, and from gutters to the pool, but I feel that’s not at all the same thing. 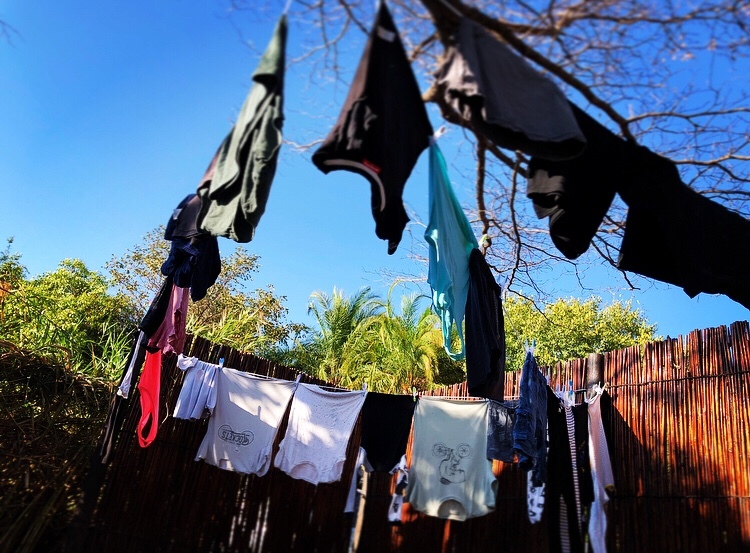 Here I am being so proud of my laundry, and all around me, people not only hand wash all of their laundry, but they carry their own water to do it in too! All of this was really hammered home this morning when after an incredibly beautiful game drive along the banks of the Okavango river, we popped in at a local store to pick up some supplies we had unexpectedly run out of. One of these things was milk. As I fought my way to the front of the petrol queue, Shaun ran into the general store with me yelling at his back, “Don’t buy milk if they only have long-life”. As it turns out, they only had long-life (not a surprise, this is true of most of Namibia). Back at the van, as I unpacked the groceries and moaned about Lola’s sudden love of cows milk, I may have mentioned milk rationing as a way of saving the fresh milk for my tea (we only have 1 litre left!). When we established (after some choice language) that I would rather not drink tea than have it with long-life milk, Shaun told me to grow a pair. Although I prefer not to grow a pair, I did think on the conversation for a while, and this is where it lead me: blessed is not at all the correct way to describe it – spoilt is. Although there are numerous things I do feel blessed about, like medical care and access to education, there are other things that are unnecessary spoilings that in no way make our lives ‘better’ than any of the people living here. Maybe the good life is in the simple places. Once you have had it easy, like everyone who is reading this right now, it makes it harder to enjoy the simple things, because you are so aware of what you are missing. In my case, fresh milk and a washing machine, and I have no doubt many more things are going to rear their heads the further away from civilisation we go. Thank goodness we had enough boot space to stock pile good coffee and toilet paper!